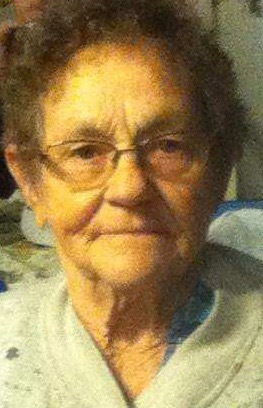 Lacy E. Cain, 84, of East Liverpool, went to be with her Lord and Savior, Wednesday, January 23, 2019, at the Truman House, following a lengthy illness. Lacy was born May 18, 1934, in Big Run, WV. Daughter of the late Harvey and Bertie Stoneking. Lacy was a homemaker and a longtime employee of Riverview Florist. She enjoyed playing bingo with her friends and spending time with her family. She was a member of Lisbon Baptist Temple. She is survived by her children, Henry Cain of Pleasant Garden, NC., Patricia Bailey of East Liverpool, Donald Cain and wife Sherry of Greensboro, NC., Harvey"Rick" Cain of Greensboro, NC., Sheila Reynolds of Burton WV. ; brother, Denzil Stoneking and wife Emma of Follansbee, WV. and sister, Cora Burdess of East Liverpool. She will sadly be missed by all including her 14 grandchildren, 21 great-grandchildren and 3 (soon to be 4) great-great-grandchildren. Lacy was preceded in death by her husband Henry Nelson Cain, sister; Virginia Kuhens and husband Charlie, sister; Vernice Church and husband Dan, sister; Violet Streets and husband Harold, sister Leanna Davis and husband Arthur, sister; Norma Stonking, brothers; Alvin Stonking,Harvey JR and her great-granddaughter Natasha Dawn Cain. Pastor Matt Phillips and Pastor Charles Cusick will celebrate Lacy's life Monday, January 28, 2019, at the Lisbon Baptist Temple, 6428 Lisbon Rd. Lisbon, OH. 44432, at 1:00 PM. Friends may visit with the family at the church 2 hours prior to the services from 11:00AM-1: 00 PM. Interment will follow at the Columbiana County Memorial Park in East Liverpool. Immediately following, there will be a gathering of family and friend's in the Fellowship Hall at the church. In lieu of flowers, you may send memorial contributions to Community Hospice, 716 Commercial Avenue SW, New Philadelphia, OH. 44463. The Cain family wishes to sincerely thank Community Hospice for the wonderful care and support provided by the staff and volunteers. The Arner Funeral Chapel in Chester has been entrusted with handling these arrangements.